I'm away all this week for Thanksgiving. But I want to give you two things to be thankful for, two tips for finishing up applications this week, and two works of art appropriate for Thanksgiving, just because. Be thankful that we're not in South Korea, where the entire college admissions timeline got pushed back by a week...because of a delay in reporting test scores...because of an earthquake that has left thousands homeless. Be thankful you still have time to decide not to be a historian. This is this fifth year in a row that the number of job postings for history professors declined. There are hundreds more new historians than there are openings at universities. By all means major in History as an undergrad--it's a great, employable degree. But think twice before deciding to go to grad school and get a PhD. in History. If you're working on applications over the break, keep yourself focused by using the Pomodoro Technique. Good news: turkey doesn't really make you sleepy. Bad news: eating big meals...with a lot of fat...followed by unstructured time...does make you sleepy. Don't plan on working on college stuff Thursday. Get it finsihed before then, or set aside time after then. Have a great Thanksgiving! Apply with Sanity will return in a week. 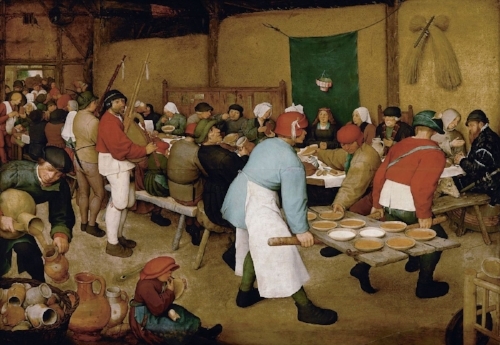 Pieter Bruegel the Elder. The Peasant Wedding. Oil on panel. 1567. Kunsthistorisches Museum, Vienna. Jan Steen. The Bean Feast. Oil on canvas. 1668. Museum Hessen, Kassel. Newer PostHow do colleges treat plagiarism?